The resources are marked by suitable age groups. All the sections will be periodically updated throughout the year. The resources are suited to the following subjects: History, English Language and Literature, Sociology, Politics and Government Studies, Religious Studies, Citizenship, Civics and Media Studies. Please send us your feedback, including any lesson plans you would like to share based on this material to gmd@ihrc.org. This section provides prepared teaching material for a variety of ages starting at 8+ until 16+. 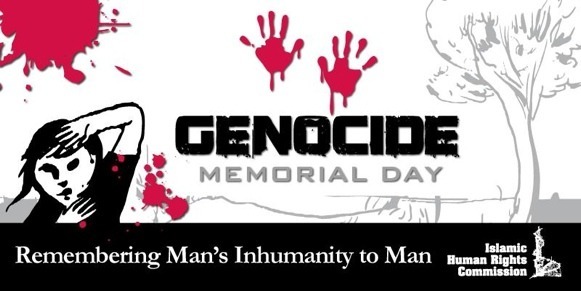 This section provides links and teaching resources for a number of documentaries looking at the key concepts of genocide and genocide prevention. This section contains a combination of online video and textual resources aimed at various age ranges from 11+ until 16+. Some links also include questions to think about for students. This includes a number of recommended books from ages 8+ to 15+, with links to discounts for school orders. A list of fiction films that relate to the topics. Review previous events by theme and media. Details of the annual GMD Poetry Competition for students aged 11 – 18.